Union Bank of India Job Notification: Union Bank of India invited applications for recruitment to 19 Specialist Officer (IT) posts. The candidates eligible for the post can apply through prescribed format on or before 09 November 2016. Educational Qualification for Manager (IT) - Oracle Database Administrator (MMGS-II) Post: 4 Year Engineering/Technology Degree in Computer Science/ Computer Science &Engineering/Computer Engineering/ Computer Science & Technology Information/Information Technology/Electronics & Communications Engineering from a recognized University/Institute recognized by the Govt. of India or its regulatory bodies. OR Post Graduate Degree in Computer Science/Computer Science & Engineering/Computer Engineering/ Computer Science & Technology Information/Information Technology/Electronics & Communications Engineering from a recognized University/Institute recognized by the Govt. of India or its regulatory bodies. Should be Oracle Certified Professional (OCP). Post: 4 Year Engineering/Technology Degree in Computer Science/ Computer Science & Engineering/Computer Engineering/ Computer Science & Technology Information/Information Technology/Electronics & Communications Engineering from a recognized University/Institute recognized by the Govt. of India or its regulatory bodies. OR Post Graduate Degree in Computer Science/Computer Science & Engineering/Computer Engineering/ Computer Science & Technology Information/Information Technology/Electronics & Communications Engineering from a recognized University/Institute recognized by the Govt. of India or its regulatory bodies. 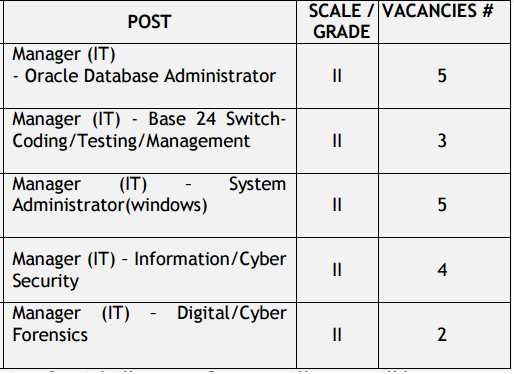 Educational Qualification for Manager (IT) – System Administrator(Windows) (MMGS-II) Post: 4 Year Engineering/Technology Degree in Computer Science/ Computer Science & Engineering/Computer Engineering/ Computer Science & Technology Information/Information Technology/Electronics & Communications Engineering from a recognized University/Institute recognized by the Govt. of India or its regulatory bodies. OR Post Graduate Degree in Computer Science/ Computer Science & Engineering/Computer Engineering/ Computer Science & Technology Information/Information Technology/Electronics & Communications Engineering from a recognized University/Institute recognized by the Govt. of India or its regulatory bodies. Should be Microsoft Certified Solutions Associate (MCSA) / Microsoft Certified Solutions Expert (MCSE). Educational Qualification for Manager (IT) – Information / Cyber Security (MMGS-II) Post: 4 Year Engineering/Technology Degree in Computer Science/ Computer Science & Engineering/Computer Engineering/ Computer Science & Technology Information/Information Technology/Electronics & Communications Engineering from a recognized University/Institute recognized by the Govt. of India or its regulatory bodies. OR Post Graduate Degree in Computer Science/ Computer Science & Engineering/Computer Engineering/ Computer Science & Technology Information/Information Technology/Electronics & Communications Engineering from a recognized University/Institute recognized by the Govt. of India or its regulatory bodies. Educational Qualification for Manager (IT) – Digital/Cyber Forensics (MMGS-II) Post: 4 Year Engineering/Technology Degree in Computer Science/ Computer Science & Engineering/Computer Engineering/ Computer Science & Technology Information/Information Technology/Electronics & Communications Engineering from a recognized University/Institute recognized by the Govt. of India or its regulatory bodies. OR Post Graduate Degree in Computer Science/ Computer Science & Engineering/Computer Engineering/ Computer Science & Technology Information/Information Technology/Electronics & Communications Engineering from a recognized University/Institute recognized by the Govt. of India or its regulatory bodies. Candidate must have either M.Tech in Cyber/Digital/Forensic or should be Certified Cyber Forensic Professional (CCFP)/ Computer Hacking Forensic Investigator (CHFI). Candidates will be selected on the basis of their performance in online Examination and/or Personal Interview. Online Exam Pattern: The exam will be bilingual (English and Hindi). There will be a penalty for wrong answers marked in the online examination. For each question for which a wrong answer has been given by the applicant, one fourth or 25% of the marks assigned to that question will be deducted as penalty to arrive at final score. If the total of the penalty for a test is in fraction, the marks obtained will be rounded off to the nearest integer. If a question is left blank, i.e. no answer is marked by the applicant; there will be no penal mark for that question. Personal Interview: Personal Interview of 50 marks shall be conducted to assess the academic& job knowledge, power of expression, clarity of thought, qualities of leadership, extracurricular activities, hobbies, general demeanor, behavior, communication skills, suitability for the post, etc. of the applicant. The minimum qualifying marks for the Personal Interview would be 25 marks (22.5 marks for Reserved Category applicants). The applicants not securing the minimum qualifying marks in the Personal Interview will be disqualified for selection.